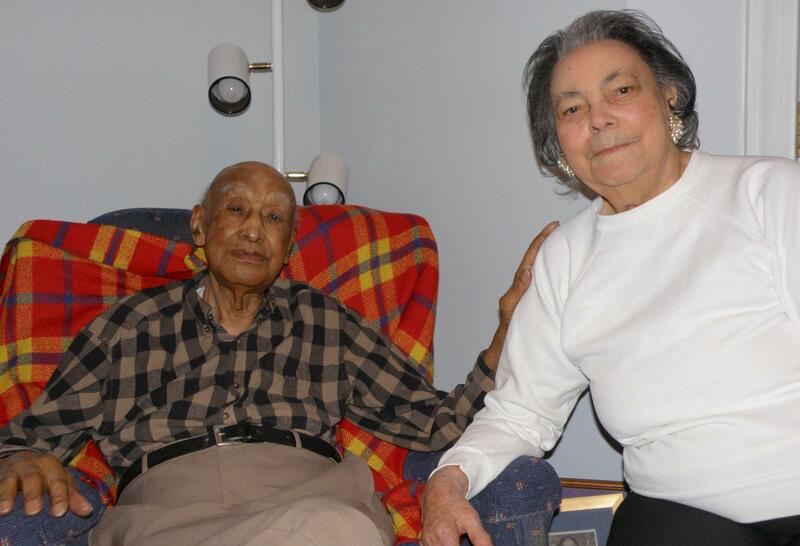 William, 102, and Bessie, 98 next month, Hudnall have been married for 79 years. For most of their lives William and Bessie Hudnall, lived in Northumberland County in the tiny village of Ophelia on the Chesapeake Bay. They've been married for 79 years. He's 102 and next month she'll be 98. For Valentine's Day they look back on their lives, beginning with a card sent by William to Bessie's sister. The Hudnall's share their story. And that's what started it all. And I've been in trouble ever since. BESSIE HUDNALL: We were both born in Northumberland, we grew up in Northumberland. We got married, lived in Baltimore for a while, then we moved to New York. I was working in Baltimore during World War II and I was helping to assemble the left wing of an airplane and there was a girl from West Virginia and I and we could work side-by-side, but we couldn't go to the same bathroom. I'll never forget that. From Baltimore we moved to New York. Saw this grocery store that was for sale and we ventured out and bought it and opened our business. And we had the people all nicknamed. We called one “Scrawny,” “Schaefer,” like Schaefer Beer. And we had a lady who'd come in and sing “you send me,” you remember that song. We had so much fun. And a lot of the people came from the Deep South and settle right there in that little spot in Brooklyn. And I'll never forget this fellow was from Alabama and it started to snow. And he had never seen snow before and he was really shook up. But crime was beginning to build up in the cities. And we just thought it was time to go. We had money enough to build a house, so we built a house in Ophelia. WILLIAM: I had my own boat. I used to do crabbing and fishing and all. BESSIE: He was hired the Virginia Marine Resources Commission as a law enforcement officer. WILLIAM: I was the first black that they hired. Then I got captain. Then later on they decided that they were going to make me the alternate captain of two boats. And then Governor Baliles said, “You did such a good job; I want to put you as an associate commissioner in Newport News for eight years. BESSIE: He was asked to run for the Board of Supervisors and he did and he won. WILLIAM: I served four years as chairman of the supervisors. I was in Richmond for a while, and I told the chaplain up there, I said, “I've got to go down home, I'm being honored.” I said, “They’re going to put my portrait in a boardroom in Heathsville, Virginia.” And he said, “Do you know where they used to hang your people? Those trees outside the courtroom." BESSIE: I've had a great life. He's had a great life. I don't want to ask for anything more.